White or grey? White or grey? White... or grey? CES 2014 is just a matter of hours away and Acer has outed a bunch of devices that we'll be able to get our hands on at the Vegas show. Included in the mix is its new budget smartphone, the Liquid Z5, which comes with a 5-inch screen, 5MP rear camera, dual-core 1,3GHz Cortex-A7 processor and 4GB of internal storage. 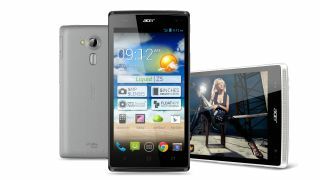 The Z5 will come running Android 4.2.2 Jelly Bean and packs a bunch of software feature such as AcerFloat for multitasking and AcerRapid for one-handed control. The Z5 also brings dual-SIM support, 3G with HSPA+ and a 2,000mAh battery. Meanwhile Acer's singing the praises of that rear camera, which is designed to offer high quality pictures in low light environments. And at a price of €169 (about £140) you certainly won't be breaking the bank for what looks like an ok successor to the Liquid Z3, though it's certainly not one to conquer the Moto G.
The exciting part is that the phone will come in two vibrant colour options - white and grey. Calm yourselves down, ok? What else can you expect from this year's CES?